Tsubaki Kabelschlepp presents its Alu Guide system, a modular aluminium guide channel available for long travel lengths on axes and portals, among other applications. The modular guide channel system made from corrosion resistant aluminum withstands high loads from acceleration, speed and wear. On gliding cable carriers, they ensure particularly quiet, low vibration running. The channel profiles with 2000 mm length are easy to install and can be individually tailored to the required width for the cable carrier. A high strength, temperature resistant stainless steel gliding layer supports speeds up to 25 m/s. New gliding bars reduce wear and increase the service life of the carrier. 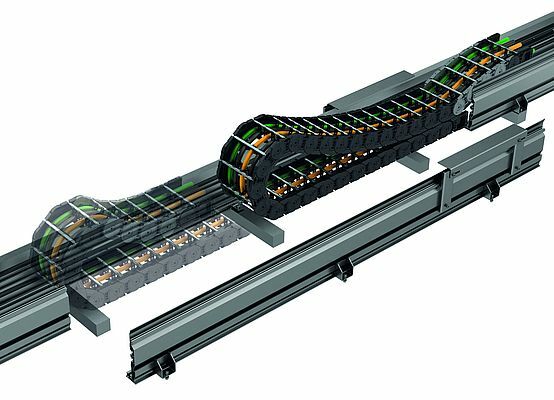 “Our customers can use this system to configure their individual solution with a modular kit,” says Werner Eul, Product Manager Cable Carrier Systems at Tsubaki Kabelschlepp. The mounting kits can be used to attach the guide channels quickly and easily from both sides. The kits contain all fixing elements required for installing the channel side walls, whereby this can be spaced independent of the supporting structure. The Alu Guide system is available for cable carriers of the types K0650 (K series), M0650 and M0950 (M series) as well as Q080 (QUANTUM series). The combination with QUANTUM Q080 is particularly suitable for applications with high speeds and accelerations. The lack of polygon effect on the Q080 delivers quiet, low vibration running. Tsubaki Kabelschlepp also offers the Alu Guide system as a ready-to-install Totaltrax system: One example are cable carriers of the M series with GO module for optimum running, a floating moving device for tolerance balancing plus Traxline cables especially developed for dynamic movement in cable carrier chains and to complete the supply LineFix cable / hose clamps for strain relief.